Lately, I've been getting quite a few emails about blogging and what it takes to make a blog successful. I am always so flattered when I am reading these emails as they often contain the sweetest compliments and enthusiasm towards blogging. While I am no expert I have definitely had my fair share of experience in the blogging world to know a few keys to success although I am always learning. I feel like recently so many posts about blog success have been geared towards how to make money as a blogger so I decided it was time for me to step in (you know, given the blog name…I only think I am funny) and give you my keys to success while not defining that by dollars and cents. While it is great that blogging can lead to a paid profession it is important to first gain confidence as a blogger and grow, two things in and of themselves that scream success to me. So since you are probably just here for those facts these are my tips for success. If you're looking for growth then social media is without a doubt the place to get the word out about your content. Personally, my favorite platforms are Instagram (@prepinyourstep), Pinterest, and Snapchat (@prepstepsnaps). In all of these places I am able to post about things that interest me while shamelessly self promoting my content to hopefully gain a larger audience. I am convinced that my blog would only have my family following along if it weren't for Pinterest so be sure to pin the images you post about and make some new friends in the process. Social media is called that for a reason and as a girl I know how we all love to socialize. If you find someone who seems to have a similar style or content then reach out to them, building community is such a fun aspect of blogging! Nobody likes a copy cat. I don't care if that term seems like we are in first grade (plus plagiarizing sounds way too scary) it was true then and it's true now. I completely understand that in the blogging world some topics are going to be addressed by a lot of different people but put your own spin on it. Readers are coming to hear your voice so do yourself a favor and allow that to shine through your posts. Don't talk about things just because you think more people may click on your post but instead discuss topics that interest you and will in turn interest the readers you've drawn in. Being authentic is also incredibly crucial when delving into the realm of sponsored posts since your readers trust your judgement but are quick enough to catch on when a post just doesn't seem like you. 8:30 AM every weekday is my time to shine. Not really but that is when my blog posts go up each day and I do everything in my power to remain consistent with that. Consistency is different for everyone however, I chose to establish new content each week day and launch it around 8:30 it's the routine I've fallen into a habit of and it is what works for me. For many people that may be too large of a commitment and they may instead choose that at 10:00 on Monday, Wednesday, and Friday they will have new content go up which works just as well. I've always been a huge fan of schedules and for blogging this is no different. Your readers will appreciate knowing when they can count on seeing new content from you and it's great that you are able to base it on whatever schedule may work best for you. Purchasing a domain name and fancy blog design aren't going to be the first things you do when you decide to start blogging but once you've committed investing in these things will make a world of difference. While I wish I could say that people don't judge books by their covers internet people definitely judge blogs by their designs. For whatever reason credibility and an easy to maneuver and well designed blog correlate so it is in your best interest to give your blog a bit of a face lift once you decide to stick to it. Investing in your design also shows from post to post. Using high quality photos to accompany your wit in posts is a great way to keep readers drawn in to what you are talking about. I can't remember the last time I clicked to read a blog post that didn't contain at least one photo and I know plenty of other people could say the same thing! This has to be my favorite tip since it is by far one of my favorite parts about blogging. I am able to allow creative juices to run free at all hours of the day with the knowledge that once I stumble upon an idea I want to pursue I am able to type up a post and share it with y'all. It still blows my mind to have followers who read Prep In Your Step daily and I adore coming up with new content to share. If I do happen to come up with an idea to pursue I like to write it down on a note I have going on my phone. this note contains roughly 30 or so blog post ideas for me to come back to when I need a bit of inspiration. Writing down your ideas will also ensure that you always have something to talk about in posts, another thing I know many people struggle with. I really hope that these tips assist some of you hoping to gain more exposure and that you are able to implement these techniques with relative ease. Like I mentioned earlier, I am no professional however, if you are interested in some of my other blogging tip posts I've left a few linked below for you to browse! What do y'all think makes a successful blog? Thank you so much for this post! 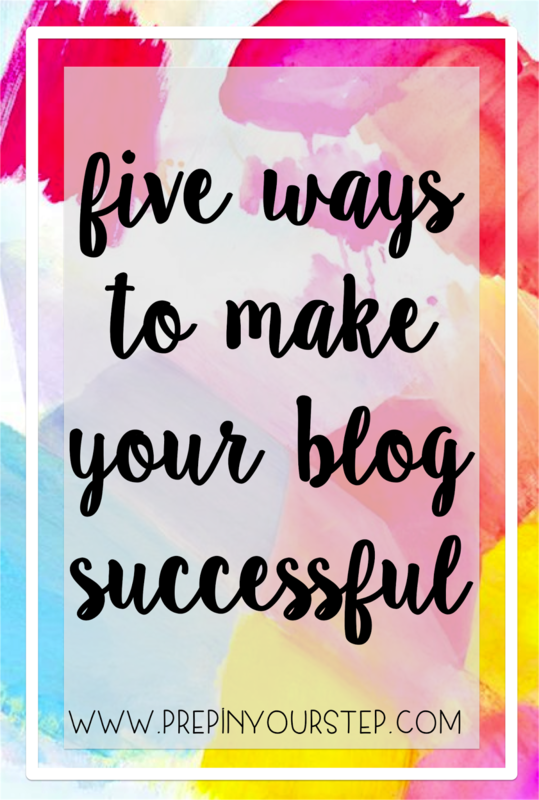 I was honestly just thinking of how to be successful at blogging! I think it's great that you are willing to help others who want to grow their blogs and readership by giving out tips. For me writing about the things that I'm interested in mainly food, entertaining, clothing pretty much things that fall into "lifestyle blogging". Everyone wants people to read their blogs, but staying true to who you are will have people comeback to read what you write because they are interested in what you have to say. Such great tips and ideas! I plan on using these!! I love that you're so encouraging to new bloggers! I just started mine this summer and it's so easy to get caught up in what's going to bring the biggest number of people in. Thank you so much for the tips! As someone who is just starting a blog it is so great to be able to read tips from seasoned bloggers such as yourself! This post was so helpful, especially after recently starting my blog! After reading this I was able to adjust my blogging schedule so it is more consistent instead of sporadic! It also gave me an inspiration for my next post! Thank you so much for all the tips! Thank you. SO. SO. much! Thank you so much! This post was so helpful, especially since I'm just starting out and have SO MUCH to learn. Thanks for the great tips. I just started a blog and am really still trying to find my style and what I want to write about. I have to agree though that brainstorming has been so much fun. I'll be at work and think, this would be a great topic for a blog post. How do you normally organize your ideas? I just bought a new planner and am thinking of writing them in there, but also am considering a life binder as well. Glad I stumbled across your blog!